A gain-switched semiconductor laser is shown to act as an optical gate with picosecond resolution and amplification for light pulses from another laser source. The amplification mechanism and the gate width change qualitatively when the gate laser undergoes a transition from a pumping rate slightly below the dynamic laser threshold to slightly above the dynamic threshold. If the gate laser is pumped below but close to its dynamical threshold, unsaturated amplification of an external signal pulse occurs over a delay time range between the external optical pulse and the electrical driving pulse of about 100–200 ps which is equivalent to the optical gate width. The signal amplification is observed to increase by two orders of magnitude and the gate width decreases by one order of magnitude if the gate laser is pumped slightly above the dynamical threshold. Amplification then occurs for input signals injected much earlier. 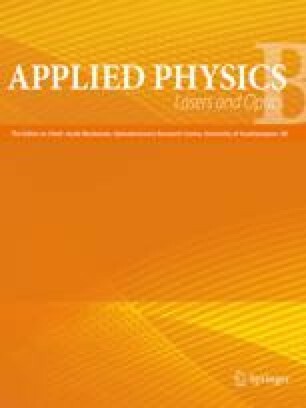 A detailed theory of coherent, time-dependent amplification including the nonlinear dynamics of the semiconductor laser is shown to account for the observations. Both amplification regimes, below and above threshold, are reproduced in the numerical simulations. The extremely short and highly sensitive gate range above threshold is identified as being due to the gain maximum related with the first relaxation oscillation of the laser.